Use all your senses, but don’t get weird about it. When writing descriptively, don’t forget the senses other than sight. Describe sounds, smells, tastes, and textures too, but only when it adds meaningfully to the description. 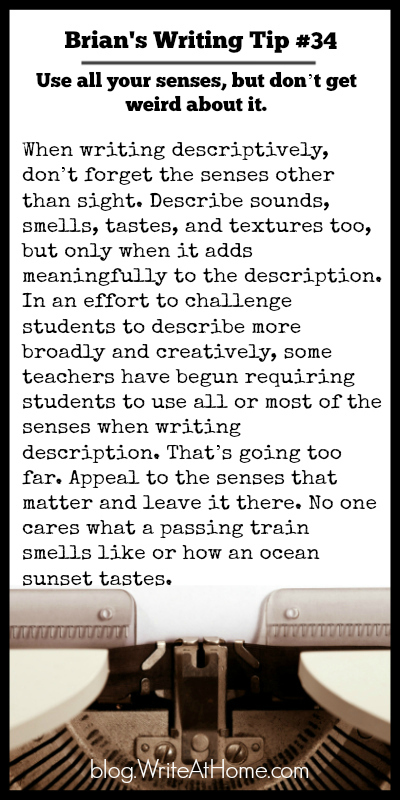 In an effort to challenge students to describe more broadly and creatively, some teachers have begun requiring students to use all or most of the senses when writing description. That’s going too far. Appeal to the senses that matter and leave it there. No one cares what a passing train smells like or how an ocean sunset tastes. I’d love to hear from you. Leave any comment or question in the Reply section below.